San Francisco State University Professor of Biology Leticia Márquez-Magaña says science is facing a crisis. When it comes to chronic illnesses like diabetes and heart disease, the people with the worst outcomes — minority communities — are often left out of research profiles. “That’s bad science,” she says. The problem is further compounded when the people most interested in studying minority health are other minorities, and they’re underrepresented in the field, she said. She and other researchers are working to change this through SF BUILD (Building Infrastructure Leading to Diversity), a $17 million National Institute of Health-funded project led by SF State in partnership with University of California, San Francisco (UCSF). 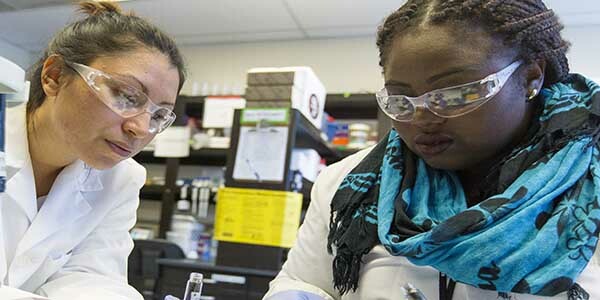 The program’s mission is to increase diversity in the biomedical workforce by transforming teaching and research environments at SF State. SF BUILD scientists working in the Health Equity Research (HER) Lab at SF State presented their work at the 11th Annual Health Disparities Research Symposium at UCSF Friday, Oct. 13. The focus of the meeting was how diversifying the biomedical workforce can lead to reductions in health disparities. “Researchers from minority communities tend to have the innate trust of those communities. 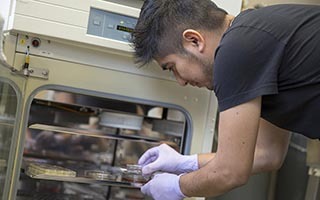 They have a better understanding of the cultural context, and that can improve the quality of the study and data gathered,” said Márquez-Magaña, who is the director of SF BUILD and the HER Lab. SF State post-doctoral fellow Cathy Samayoa saw this firsthand in her research. She’s studying the biological effects of peer-administered stress reduction techniques on Latina breast cancer survivors. She had a 95 percent participation rate and more than 90 percent retention rate from the 100 Latina breast cancer survivors she contacted for particular measures used in the study. Márquez-Magaña predicts the high rates are due to the cultural congruency between scientists and community members “Dr. Samayoa is Latina, grew up in a Latino community, and speaks Spanish. There are a lot of barriers that get broken down when you come from those communities.” Samayoa presented her preliminary findings at Friday’s symposium.